BALTIMORE (CNS) — The U.S. bishops approved their first new document in 30 years on preaching Nov. 13, the second day of their annual fall general assembly in Baltimore. The document, “Preaching the Mystery of Faith: The Sunday Homily,” encourages preachers to connect the Sunday homily with people’s daily lives. The vote was 227-11, with four abstentions. 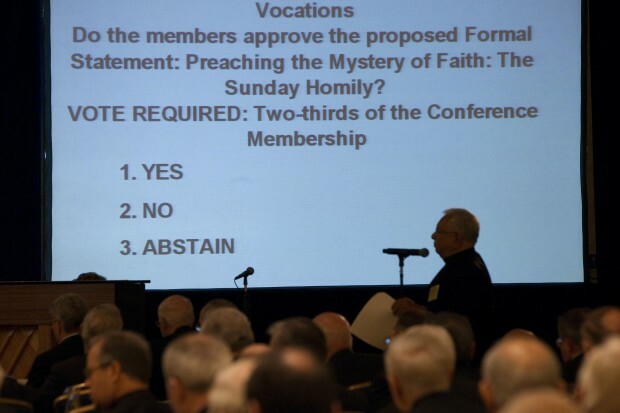 Approval required two-thirds of the membership of the U.S. Conference of Catholic Bishops, or 182 votes. There were four abstentions. The document was prepared by the USCCB Committee on Clergy, Consecrated Life and Vocations, chaired by Archbishop Robert J. Carlson of St. Louis, with subsequent review and comment by eight other USCCB committees. During discussion on the document Nov. 13, the bishops accepted a plea from Bishop Ricardo Ramirez of Las Cruces, N.M., to include his amendment urging Catholics to make an extra effort to listen to the homilies of foreign-born priests for whom English or Spanish is not their first language. Those priests’ speech “may have a heavy accent that the congregation cannot understand,” Bishop Ramirez said. “We have many foreign priests coming to work in our dioceses,” he added. “Preaching the Mystery of Faith” also required a suspension of the rules governing consideration of proposed documents issued in the name of the USCCB, as bishops did not receive it at least 30 days prior to debate. “The homily is intended to establish a ‘dialogue’ between the sacred biblical text and the Christian life of the hearer,” the document says. “Virtually every homily preached during the liturgy should make some connection between the Scriptures just heard and the Eucharist about to be celebrated,” it says. Before preaching, “the homilist may need to wrestle for a while with the challenging aspects of the biblical Word, searching for ways it could connect to ordinary experience and how it might be proclaimed to the congregation the homilist serves,” it says. At a Nov. 12 news conference, Archbishop Carlson said that, in addition to review by other USCCB committees, there were times he went to “the back of the church” to hear what congregants said about the preaching they had just heard at Mass. Further, when a Catholic News Service story was published about the writing of “Preaching the Mystery of Faith,” “we got a lot of comments in the mail” from readers of the article, he said.